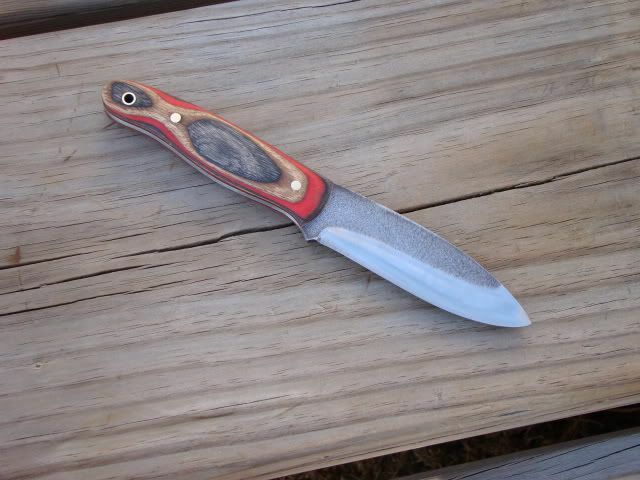 A while back I got the urge to make a no frills, no BS bushycraft knife prototype. 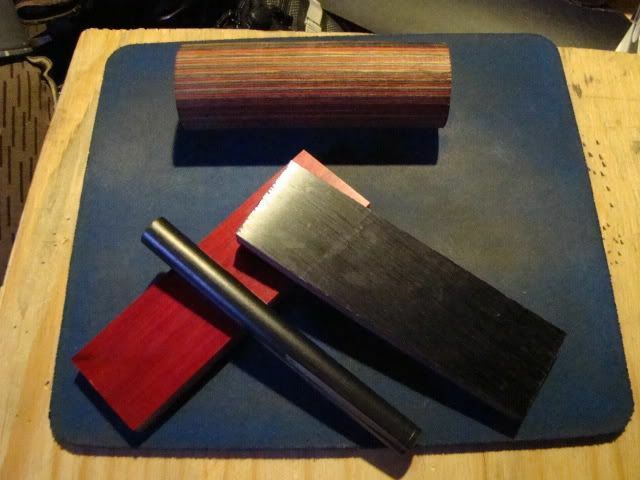 I had a woodlore style blank I was working on in CPM3V and decided to regrind it and reshape it. 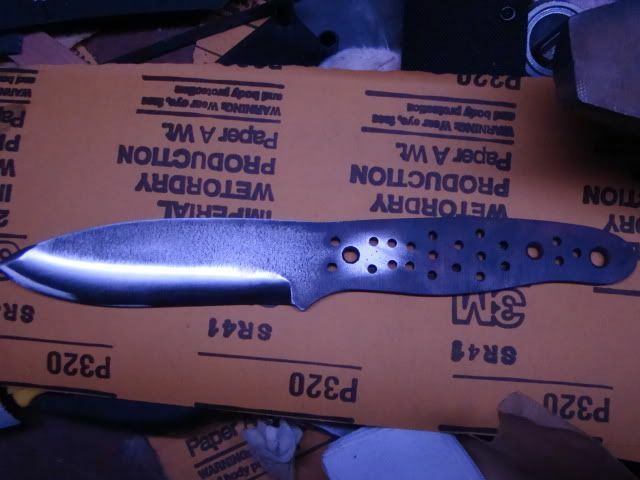 The pics that follow show the progression... here's the blade fully shaped and partially ground. Rough sanded and finish ground. The scales and firesteel stuff to fill out the set. All epoxied and viced up. The scales profiled to fit. Refined a bit on the belt sander. When the Mrs doesn't mind me leaving the house, camera in tow to go get some pics I am usually pretty pumped up. This goes double when this happens during the autumn. The pictures usually just stack up, one to the next, and I always feel like I am missing so much.... but not this year. Ohio is as muted as is gets for colors this year... at least in the central part of the state. I took the car and drove down to deer creek because there is so much water I figured something had to have some zap going.... not so much. Not to say there weren't some good views and pics to be had because there were... It was just not like the last few years. That's OK I guess just not what I expected. I'm not a real movie reviewer sort of guy. I don't mind writing about books and trying to be objective but movies... they are just this whole other level of thing that I prefer to simply enjoy. I had the good fortune the other night to see The Book of Eli and was moved. So here, int he paragraphs that follow are my thoughts and why I say see it if you haven't. Imagine a world where mankind unwittingly turns down its own volume and produces, in the process, a barley livable wasteland from the world of remarkable luxury we enjoy today. What would happen? While things spin out of control and the world balances the population with the sustainable resources that are left, men who are evil and strong will rise and men who can may very well hear the voice of God and do its bidding. The Book of Eli explores this idea and the results are remarkable. Most everyone knows the words to the 23rd Psalm. For the first time, those words rang off the screen in stark contrast to the world and surroundings in which they were presented. The beauty of the idea and verse became obvious and offset starkly the burned out and decaying world in which they were spoken. It's in that moment that you may begin to realize, as I did, that the Bible is not written to be relevant to modern living. Seeking the truth of the non-fat late lifestyle in its pages may be a perversion of a powerful thing. When life becomes as bad as you can imagine it, when you are holding on to nothing with everything you have and the reward is your beating heart, the words of the bible are there. It is a staggering moment when you realize we are all prosperous, not because God has made it so, but because we revel in the distance is places between us and our creator. The Book of Eli is an excellent movie and I would recommend it to all. There is more than enough blood and violence to keep it interesting and, as I think I have expressed here, the spiritual points it raises, possibly unintentionally, are pretty solid as well. You should see it. 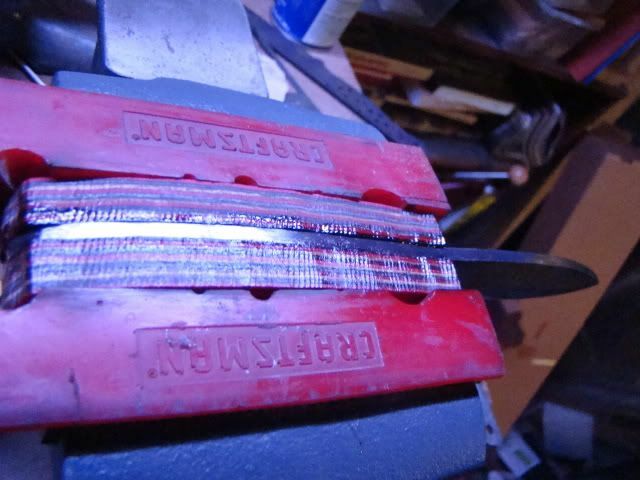 One of my favorite things to do, in all of the world, is to make a good knife. I have pretty well stopped now since we have two kids under 10 and my job appears that it may actually turn into a career and the wife was carrying way too much of the load... I had to stop for a while. 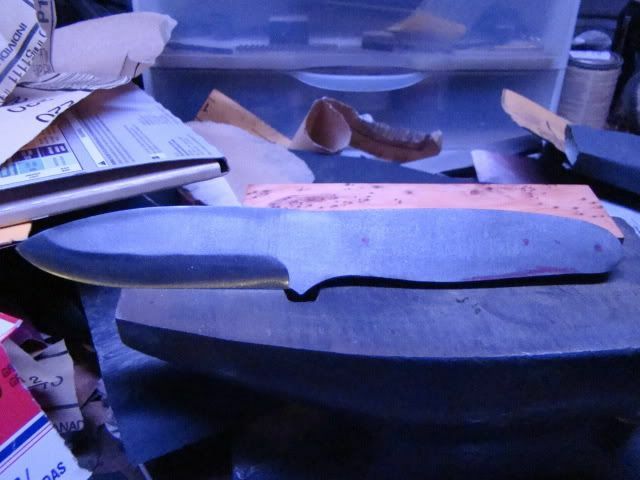 Guys just have to keep priority where it belongs and on the work bench, making knives for customers at cost to gain experience, is not where things need to be. 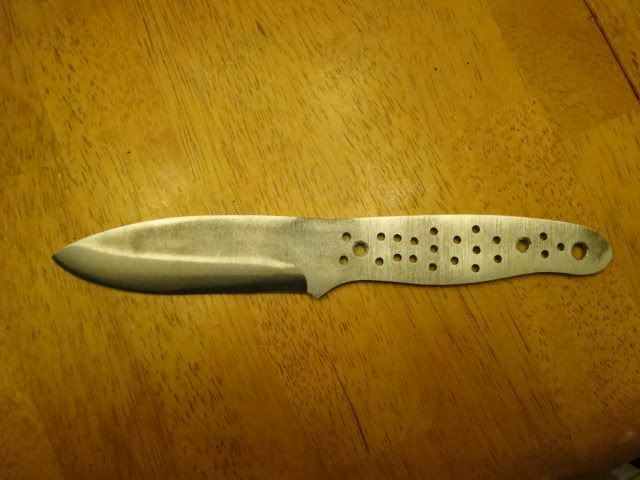 One perk to finally having quite a few knife projects under my belt is that for the simple ones, the three piecers and full tang jobbies, I have really begun to be able to produce something I would pay for. Take this guy up above here. For as long as I have been really interested in making I have admired the work of Lance Ockenden. His bird and trout model has inspired me on multiple occasions and I have made one other effort to copy it. That was a good one but not exactly what I wanted so... I traded it for a logo or two and moved on. I spent a month with a pad drawing and redrawing the lines trying to get something that really worked for me from all the angles and came up with this guy. Now, it's not done. There are some finish sanding things to do and the lanyard hole needs a bevel and so on but I can say, for the first time in a long time, this one stays with me. It's what I was after. 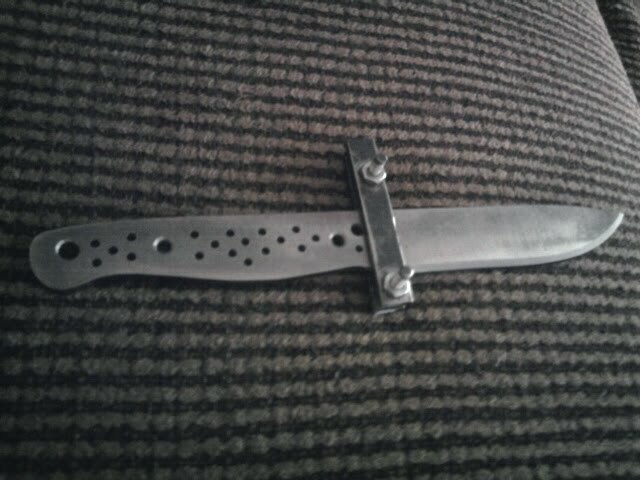 The steel is 1/8" A2, hardened to 59 HRC. The scales are black locust burl with couple of 1/8" brass pins and a 1/4" brass lanyard tube. 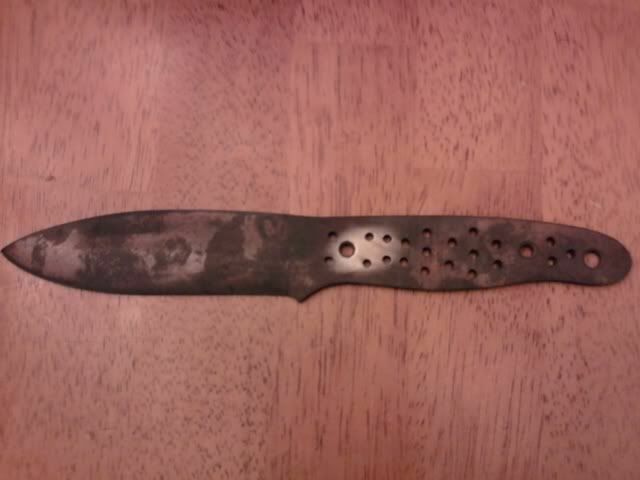 The spacers you can't see here are 1/16" G10 in a dark cedar green. I think the combo of the wood and spacer is just wonderful. The bevel is a slightly convex Scandi grind that I cut 100% by hand. The jig it's sitting on there is what I use to shape the initial bevel before HT. After it returns, I use some 200 grit sand paper and a mouse pad and shape things down to a sharp edge. 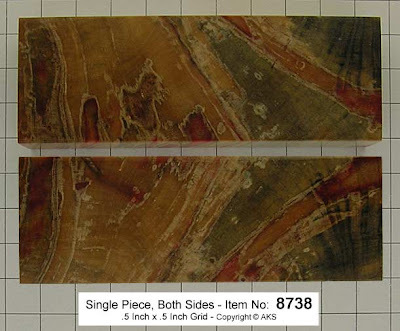 (by my count this one too 34 sheets of 200 grit to shape...) Once the shaping is completed, I advance up the grits to 400 and then 600 and then 800 and so on, finishing up the edge with some flitz metal polisher. I am anxious to see how sharp it gets when I am done. 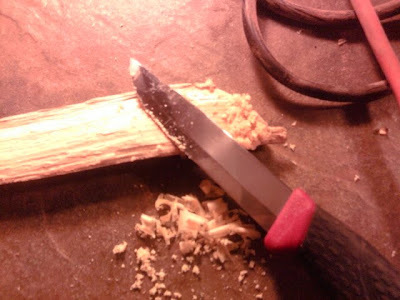 In concept, I find that while I enjoy just beating the tar out of a knife battoning or whatever, in the end I usually use my axe and Mora craftline more than anything else. I wanted something personal that was a bit more rugged but still elegant in form. I think we have it here. I'll post more when I finish up. Thanks for looking. One of my favorite October exercises is working in the garage, trying to get it ready for winter. You'd be amazed at the crap that collects... Anyhow, part of this for this year was finally getting to clean up my workbench. There was dust under the grinder from two months before my son was born (April since he came in June) and I had not had a chance to really get out there into it. When the food pantry shelving collapsed on Monday, I decided it was time work... so I did. In the process of cleaning out, I found three or four chunks of wood I had cut from a pine at my folks place back in early, early spring because I thought they were fat wood and I wanted to try them out... I wanted to know if I knew how to spot it. So today when I found them and the bench was cleaned off I decided it was time to have a little fun. 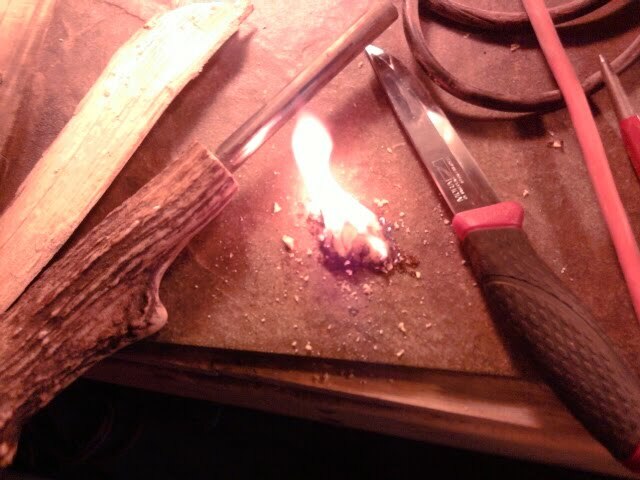 I grabbed trusty my Mora and shaved and scraped a little and then, I grabbed my uber-firesteel and hit the pile with some sparks. I still managed to find my way into the bush for a while. This is / was a good thing. and served up in a saintless cup with a wire handle, is just fundamentally better I think anyway. but that ended like all of my other spoon attempts so far. My favortie part of any day out is when I find myself, even in woods I regard as familiar, in a spot untrampted and new to me. Underbrush like untrodden snow.... Trees and scrubs everyewhere. It's a small bit of paradise. With any luck, I'll get back out there sooner rather than later. Take care. Oh yeah... I made a little vid about it too... Check it out. Sometimes I lull myself into this false sense of how things will be. For example, when my wife began working frantically to make things ready for my son to be born in early June, I said she was insane. We would be spending most all of our time at home while he was little little and we'd have all sorts of time to get things done. Man on Man was I off base. I have, in almost 3 months, been in the bush one time. The day was great but abbreviated and even while I was cataloging tree leaves for future ID, I could only think about getting back home. My little ones are just demanding as hell but there's nowhere I would rather be. It's going to be a crazy summer here at Casa del Joel. The wife is getting ready to, any day now, deliver my son into the world and with that our workload as parents will climb by a power of two. Coupled with that, the job is really going well and I am making great strides there but it takes a ton of work. I am getting almost no bush time anymore. This bothers me... a lot. So I have set to thinking about this lack of dirt time for about a month now and have come up with an idea. For at least a couple of these I am going to have to make it back into the timber however, for a chunk of them I can work from my back porch or garage. I have a couple of days to think it out and pick one for June. I am leaning towards #2 as my first task. No matter though. It's time to start doing and with the lack of any real content on BCUSA these days, I seem to be on my own again for ideas. This may not be a bad thing and I have made some good friends there to help out if I get stuck. (Thanks Guys) Anyhow, take care if you want to join in, email me. I decided, for my last trip to the woods before the baby is born, I wanted to test out some axes or at least one axe that only cost a few dollars to set up. I acquired three heads and picked the Collins Homestead model as my first try. I didn't know much about working an axe bit down to the right width and it shows here. The edge is really sharp, but things are still too chunky. After my son arrives, I am hopeful to get back into it again and see if I can do it better next time. 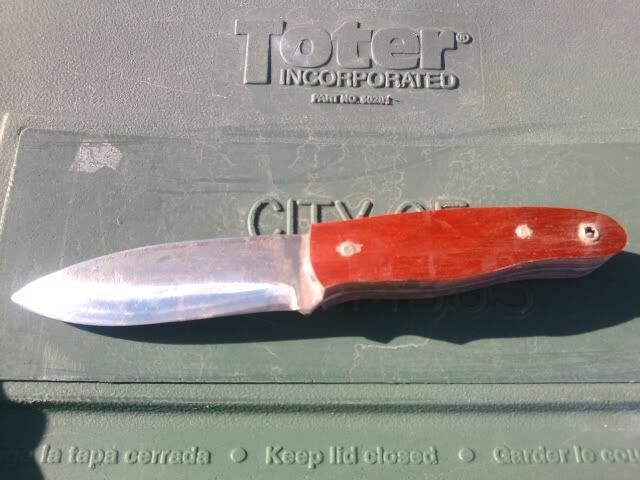 For a while now I've been working with making knives. 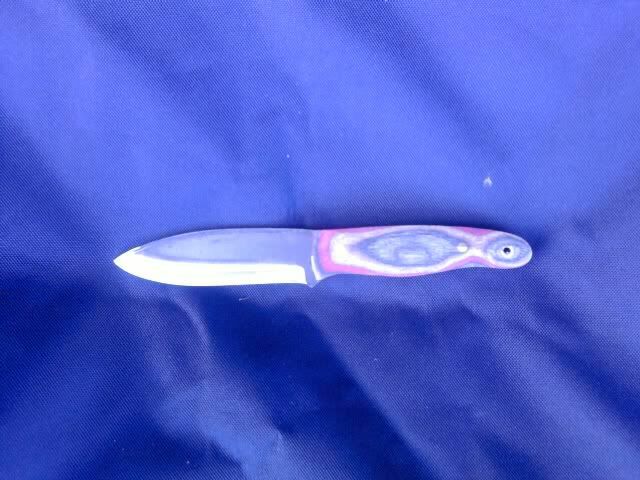 Like most folks who first discover the world of customs, I was totally infatuated with shiny, pretty knives. While I am still very impressed by the level of craftsmanship that goes into them, I am thinking I have moved beyond that fascination. 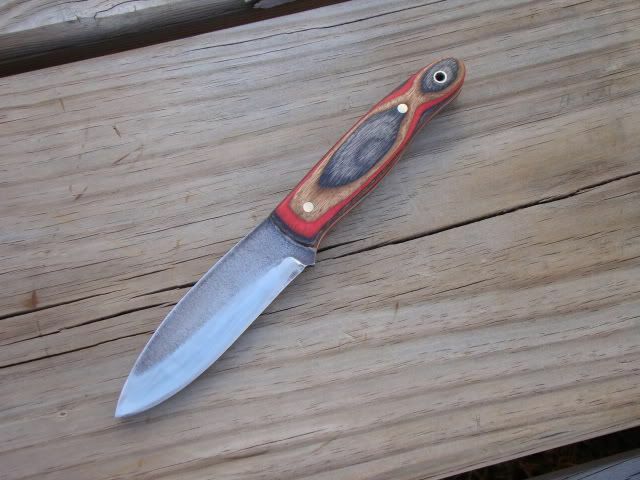 I've been a member on bushcraftusa.com for about 8 or 9 months now and in that time, my ideas of what makes good knife have shifted quite a bit. 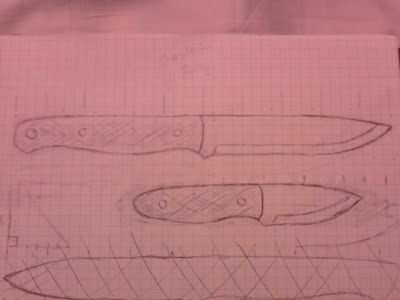 This is due in very large part to seeing how the guys who use one (I mean really USE a knife) make it do what they want and in discussions the guys who make the knives for them. To that end, I have been working with different designs, trying to find what works best for my hand and for how I do things out and about. To be fair, I have had customers placing orders along the way that either showed my for sure what I didn't want or contributed something to the ideas I had. 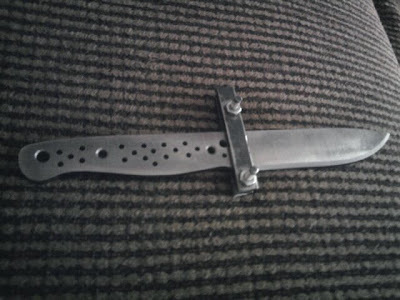 I've built big knives and didn't like them. I've played with the woodlore clone in about ten variations and didn't really dislike it I was just not all that sure I couldn't make things work a little better for me. Then, by happy chance, one day I had about 9 inches of 1 inch by 1/8 inch A2 and nothing to do with it. I decided to fuse two or three designs I love and came up with this one. This is by far and away the best user I have ever made. It fits like a charm and is tough as Hades. The scandi is convexed to an edge and it is just plain durable. I've really put it through its paces and identified only two real shortcomings in the design. 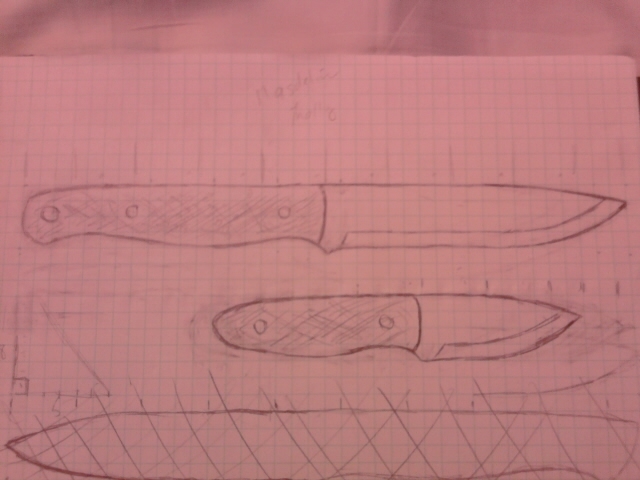 It needs a longer blade and the handle needs to be shaped just a little bit differently under the lanyard tube. Anyhow, I've decided to call this model the Waldgeist. Look it up. You'll see what I mean. Thanks for lookin' and take care. The A2 in this thing just finishes fantastically. The Oak works with it so well. I am really pleased with this one. 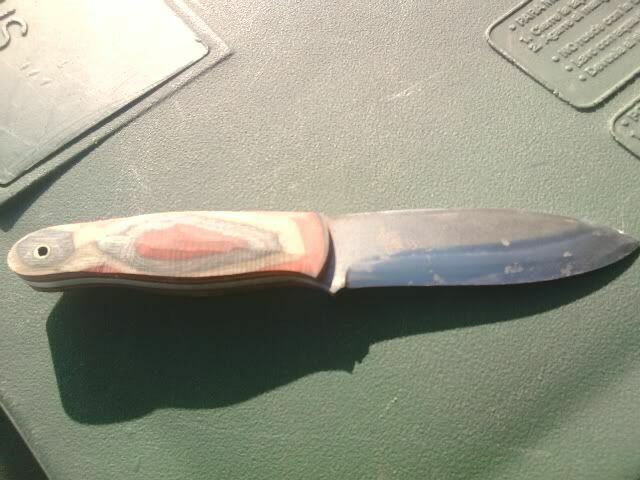 I just need to get it on the stone and finalize the sharp and it's done. Let's hope whoever gets it is happy. Gotta roll. Two more to finish, two more to grind and... at least one more set to send off.... Later. Readability - 4 of 5 - It's well written and about as easy to read as a text book on a subject you want to learn. Editing - 5 of 5 - superb work editing this book. Flow is very well done. Subject Matter - 5 of 5 - Seriously, a must read for anyone looking to spend time out of doors in that dirt-timey sort of way. Did I like it - 4 of 5 - I liked it a lot. It's a dry read but I find that I can use most all of it. 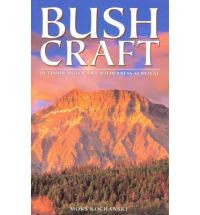 I'll say it again, a must read for any wood-be outdoorsman / bushcrafter / survivalist / etc. This book is a wealth of knowledge. Worth every dime in my opinion.